The gospel testifies to the Roman manner of torture in which Jesus endured humiliation and a brutal beating before he was nailed to the cross. The beating was intended to inflict maximum pain short of death and to satisfy the crowd’s demand for the death of Jesus. Pilate presented him to the crowd, crowned with thorns, which produced severe pain and profuse bleeding, and in a horrendous state of dehumanization, saying, “Behold the Man” but they would only be satisfied with his death. The trial ended. “Jesus was led away carrying the cross himself” (John 19:17). Medical opinion has varied about the ultimate cause of death. After three hours of hanging on the cross, he was exhausted from lack of sleep and loss of blood, dehydrated, and extremely weak. Asphyxiation seems to be the most common cause of death in crucifixion. However, some believe he died of a ruptured heart. 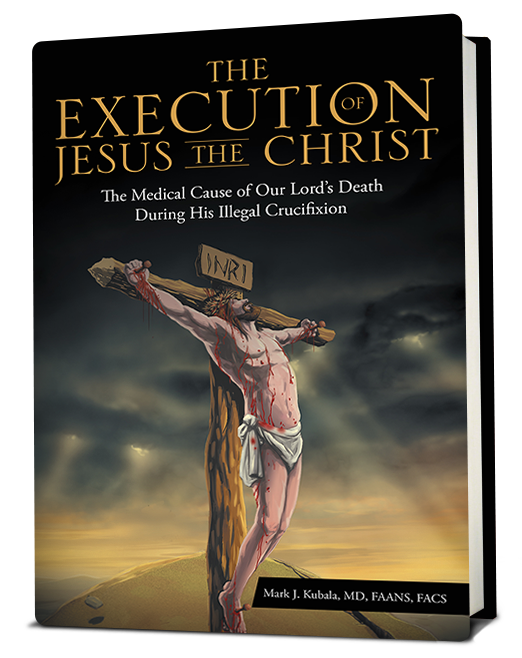 But Dr. Mark J. Kubala offers convincing medical evidence of a different sort into the ultimate cause of Jesus’ death on the cross. His conclusion accounts for Jesus’ rather quick death after being nailed to the cross, which is verified by the surprised Roman soldiers (John 19:33). Kubala gives sound medical reasons for his conclusion as to the cause of death, allowing contemplation into both the humanity of Jesus’ love as well as his divine love. Copyright © 2017. Mark J. Kubala, MD, FAANS, FACS. All rights reserved.